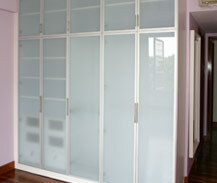 Specialising in Aluminium Framed Glass Door fabrication. 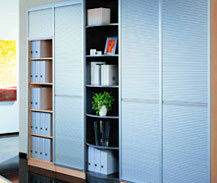 Ranges of doors includes, Casement, Sliding and Bi-Fold and cabinet accessories. The flexible space saving shutter enters the world of modern globalization, expanding its vast applications towards kitchens, offices, retail stores, trade show exhibits, push carts and living space to meet its niche. The sleek design was created using a combination of innovative, hard-wearing materials including aluminium and glass, unlocking the richness of electrophoreted aluminium, the framed cabinet door combines contemporary style with practicality for kitchen, wardrobe, drawer, and office applications. The journey of flexible living begins with our in house fabricated OPSH flexible storage system, aluminium pole with unique fixtures reaching individual design and function. 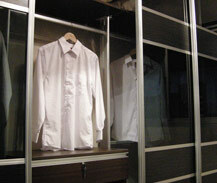 It is widely installed in wardrobe, work station, display shelf and entertainment system. Trouser Rack with Slides Insys multi-purpose aluminium framed trouser rack enhanced pull out feature, shaft tubes interchangeable, add & remove freely. 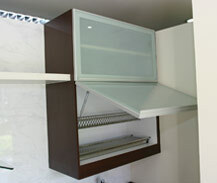 Thus extended for convenient reach and maximizing storage space. Customized to all cabinet dimensions.